I just finished this oil painting today. I have not given it a name yet. 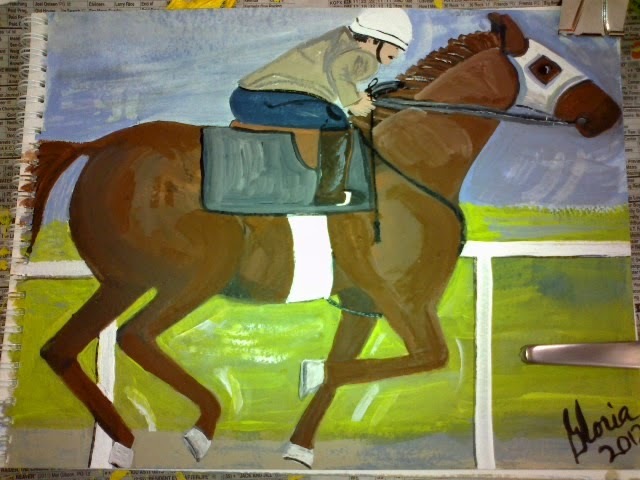 I took a week to paint it and it tried my patience to a degree, because I couldn't quite get the pose of the horse right. But here is my this year's [ 6 April 2015} contribution [of art to the world] of the annual horse races in the spring, of the Kentucky Derby, Preakness, Grand National. 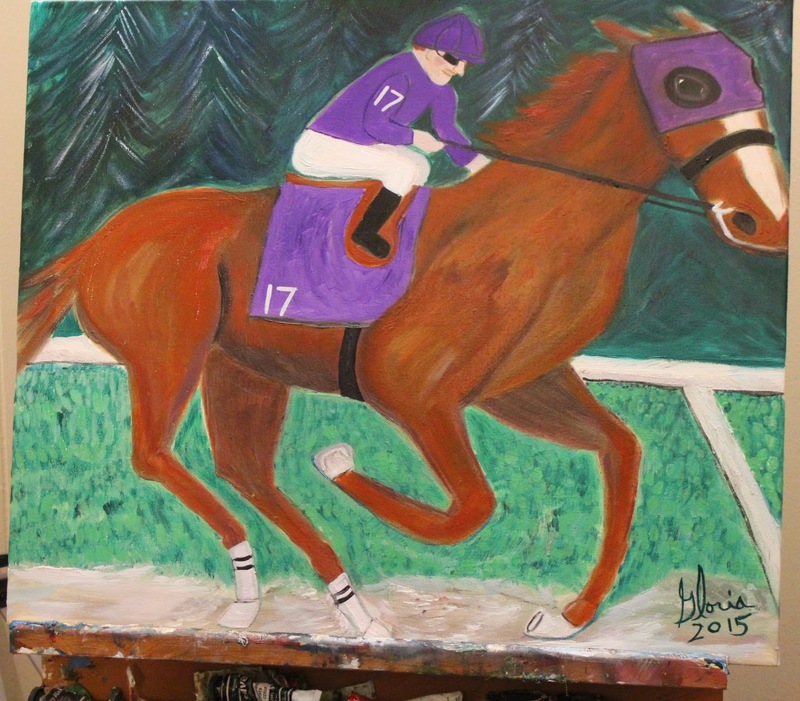 I painted this with the owner of horse riding it and not the pro jockey that rides in the race. The owner is not a real person. In fact, none of these "persons" in this art are exactly as any real, living human person but were created entirely by me with paint. This is 18 x 24 oil on canvas. 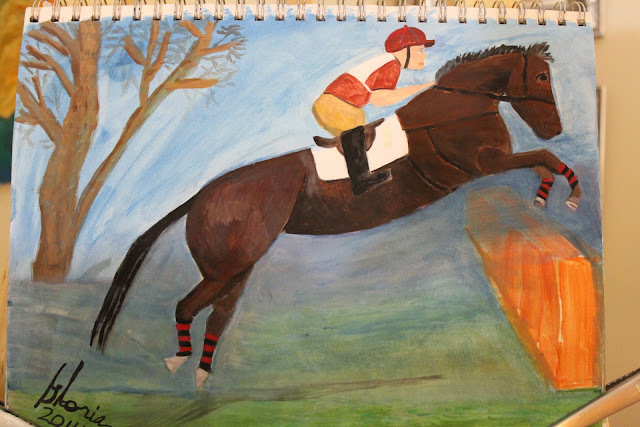 This is the jumping horse sketch I painted in 2014. 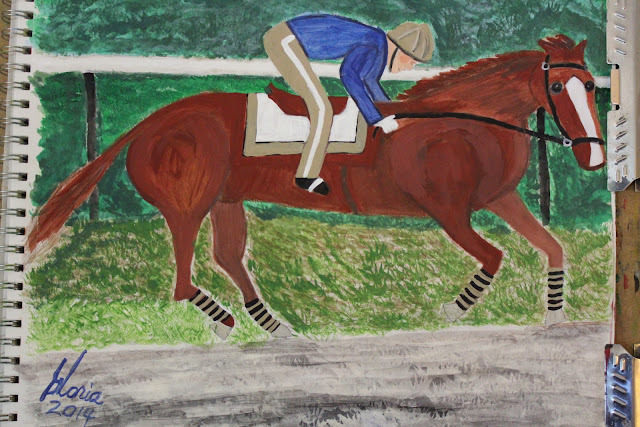 This is the sketch I painted and named "Kentucky bluegrass" and it is on other blogs of mine also. 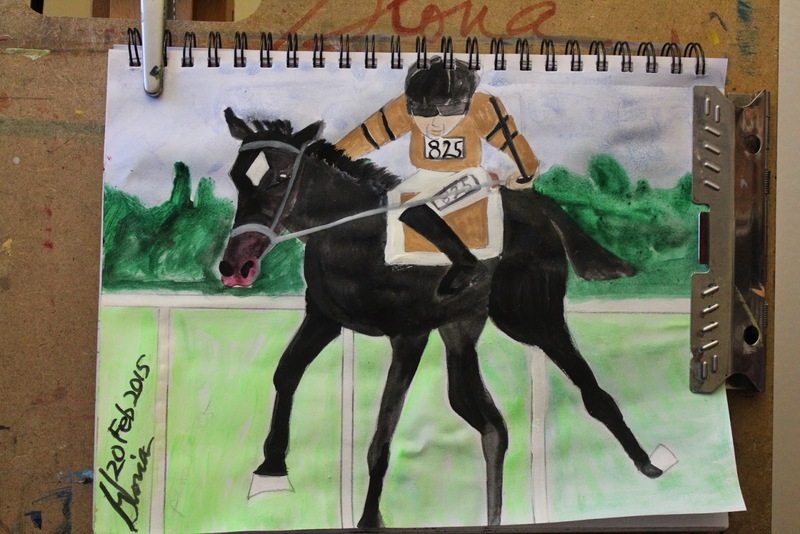 This is my sketch of the Preakness in NY, that I painted last year. This is the sketch I painted of a horse in full run, that I created in Feb 2015. 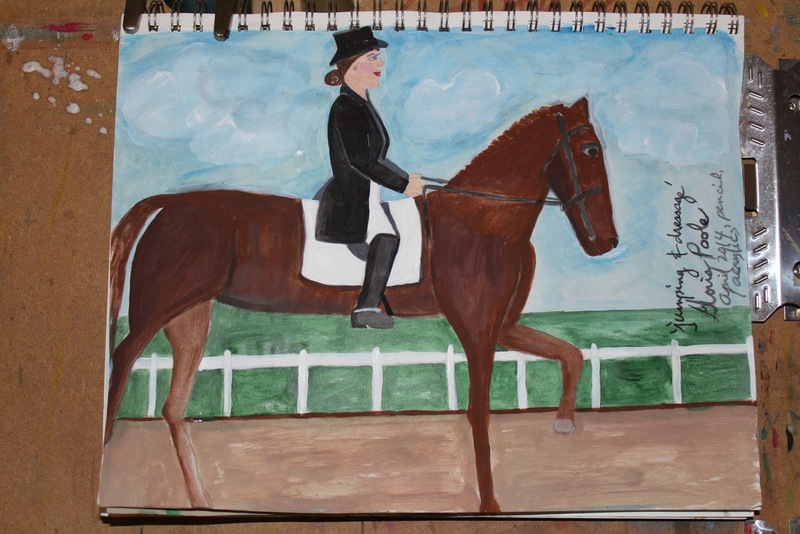 This is my sketch I painted and named "jumping and dressage" in April 2014. 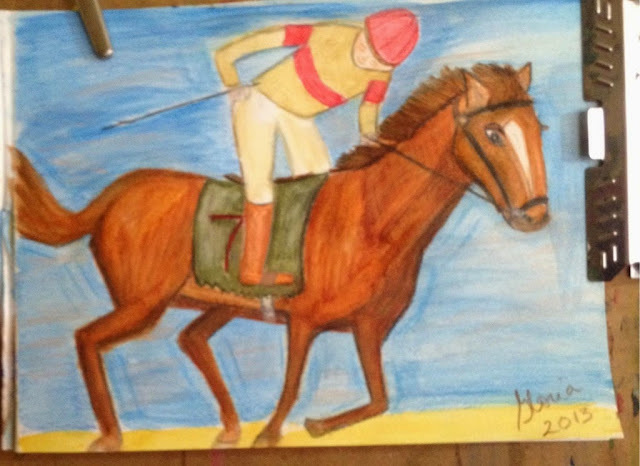 This is the sketch as it looks after I repainted it and named it jockey standing on horse in May 2014. This is the sketch of a professional jockey riding in race that I created in 2013. This is one of my photos of the U S flag I photographed on walkabout to remind all I am U S citizen and have all Constitutional protections including the first amendment. It is necessary to add this statement intermittently to my blogs because cyber-criminals that LOOK AS IF they could be from another country broke into an online album of mine and into 2 cell phones of mine and tried to hijack them, [recently]. 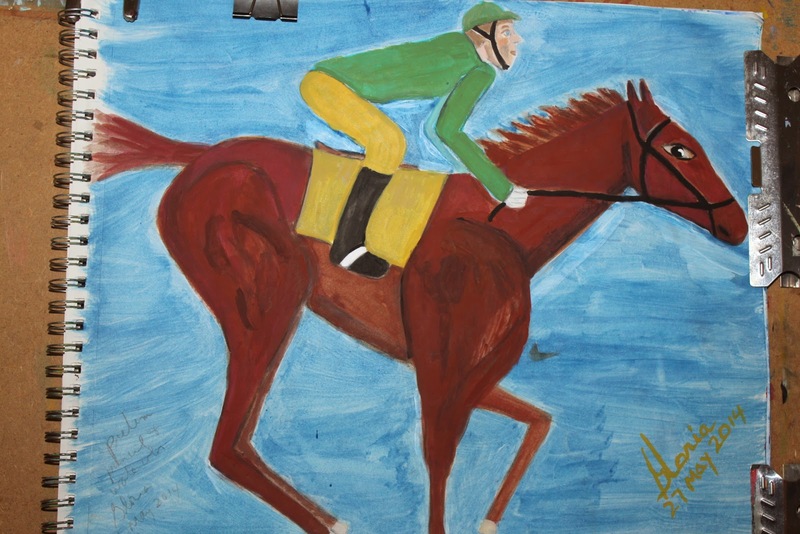 Also, I am leaving this post up for a while yet, because spring is the season of the horse races in several places around the world. All telephones associated with this blog and its underlying account belong to me Gloria Poole personally and are physically located in my apt in Missouri except when I walkabout. But of course, my landline telephone does not go along with me on walkabouts! Also, for the record, all symbols that represent me on this blog or any blog still represent me. This is my selfie of me in spring 2014 but I look exactly the same. I still put my hair in a lop-sided pony tail when I walkabout or paint to keep hair from getting in my face or paint. 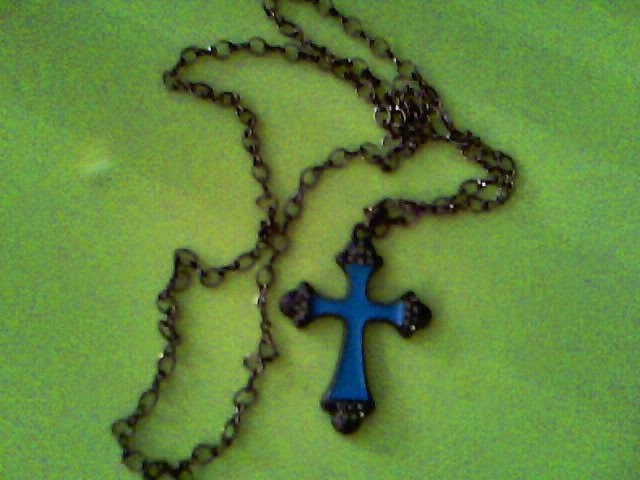 This is a christian cross of mine to remind all that this is a Christian website and that I am a Southern Baptist christian woman who adheres closely to the Holy Bible. 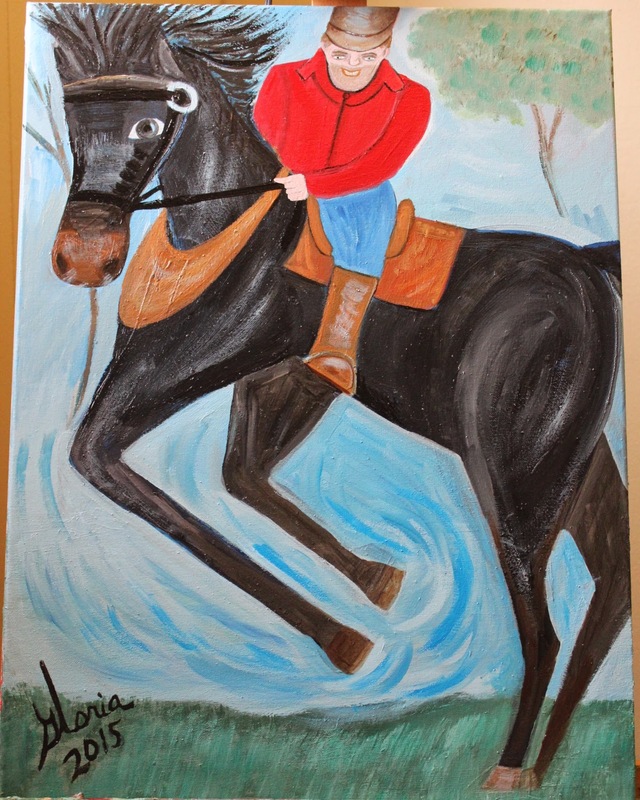 As always this blog and all content on it belongs exclusively to me Gloria Poole, RN, artist of Missouri and I own all rights to it. I do not have a son, and I have only 2 grown daughters named Jennifer and Leigh who also have minor children of their own. 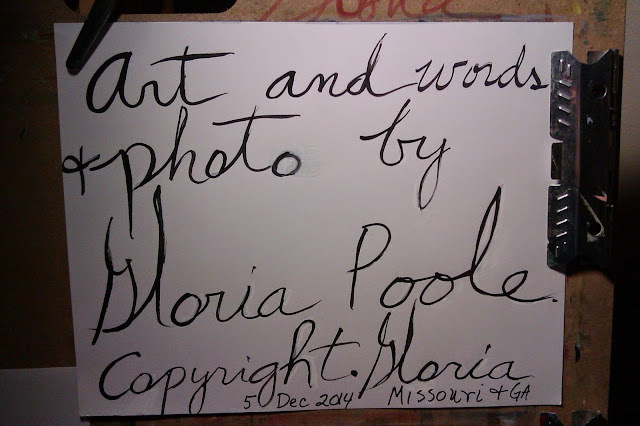 Copyright notice 7 February 2015 at 12:36pm: This blog and all content, all words, all photos and all art on it were created and posted by me Gloria Poole , RN, artist of Missouri and Georgia. Usually I sign the art I create as simply Gloria since that is my first name I was born with; but on pencil drawings I often also sign my born with surname of Poole. I am also known on the web and in real life as Gloria Poole; Gloria J Poole; Gloria Poole, RN, artist; and on the web as : gloriapoole; gloria-poole; gloria.poole; Ms Gloria Poole; gloriapoole.RN; gloriapoole_RN; gloriapooleRN at yahoo; gloria0817; gpoole817; artist-gloriapoole; gloriapoole-paintings; artist-gloria; Poole,Gloria; gloriapoole1749; and other variations of my real, born with, and legal name of Gloria Poole. For the record, I am a white, twice divorced Christian woman and the mother of two grown daughters who are named Jennifer and Leigh. I am also a prolife activist, blogger, artist in all mediums; photographer for my own purposes, Registered Nurse with a license in Missouri but before that for most of my life in the state of Georgia, U.S. citizen born in the state of Georgia; University of Georgia alum, Georgia Baptist College of Nursing alum, writer, illustrator, author. This blog may not be downloaded, nor copied individually or collectively as a whole; nor have domains forwarded to it that do not belong to me, nor may the photos or art on it be reproduced or saved to disk by anyone . I create all content on this blog and I, Gloria Poole, own all rights to this blog collectively and individually as single posts. The telephones listed on this account belong to me and are in my apartment in Missouri or in my possession at all times. Some of my numbers are wired, landline telephones and some are mobile phones. 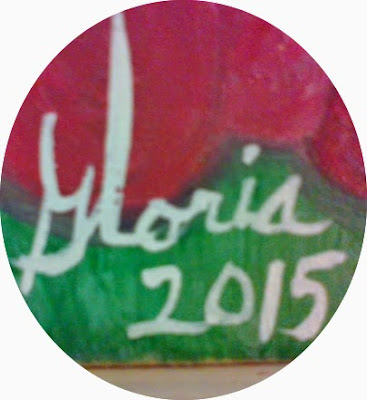 This blog and all blogs that I create and that contain my words and or art and or photos that I create belong exclusively to me Gloria Poole, of Missouri and Georgia. Copyright. 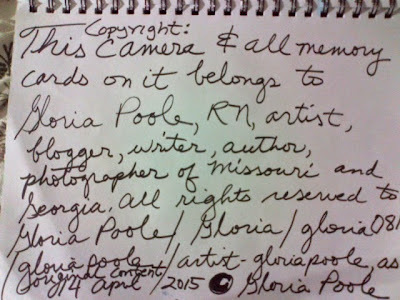 Gloria Poole /gloriapoole /gloria-poole /gloria.poole/ Ms Gloria Poole/ Poole Gloria at my own, private apt in Missouri which is not shared with anyone and neither is my equipment nor phones shared with anyone, and nether is my isp account shared with anyone. Gloria Poole, RN, artist; at my apt in Missouri on 6 April 2015 at 6:27pm.Update on 19 April 2015 by me Gloria Poole,RN, artist of Missouri to add in fact that I have other blogs that include art I made [for provenance and copyright issues] and to add in U S flag since cyber-criminals made an effort to try to ruin me by posting unknown to me persons'[ multiple] photos into an album with my very name on it, and they posted a few photos of dilapidated slum-like houses also, that I had never seen before until I googled my own name to find a photo I had photographed & posted on the web. It was a shock to me to see the faces of people I didn't know who used my REAL name to try to promote themselves with what I suppose was photos of themselves and their slum like house [where?] and of the leader they admired [but that I despise!}. So, in an effort to document these events, I am reminding all that I am a white woman, Registered Nurse, am artist in all mediums, am photographer, writer, author, cartoonist, illustrator all for my own purposes. I do not have "boss" and have not had any boss since year 2003 when I worked for a hospital. Most of my work experience is as RN for medical facilities. I did learn to draw formally and I learned to paint from a tech school course on mixing paint and was first taught by my mother's sister in Virginia years ago. Cyber-criminals cannot authorized themselves to use my real name nor add their photos to my online albums. /s/ Gloria Poole, RN,artist; Missouri 19 April 2015 at 2:26pm.